By default, Chili Piper will create a Lead in Salesforce if the prospect does not already exist. Furthermore, Chili Piper can create a Contact if an Account already matches, if you have this setting turned on. These settings can be found in "Manage Workspaces". However, some companies always want to create a Contact, never a lead. That is possible with Zapier. Make a new Zap and include Chili Piper "New Meeting" as the Trigger. See here. (optional) Create a Filter if you only want your Zap to run for specific "Event Types", "Event Queues", or other parameters. 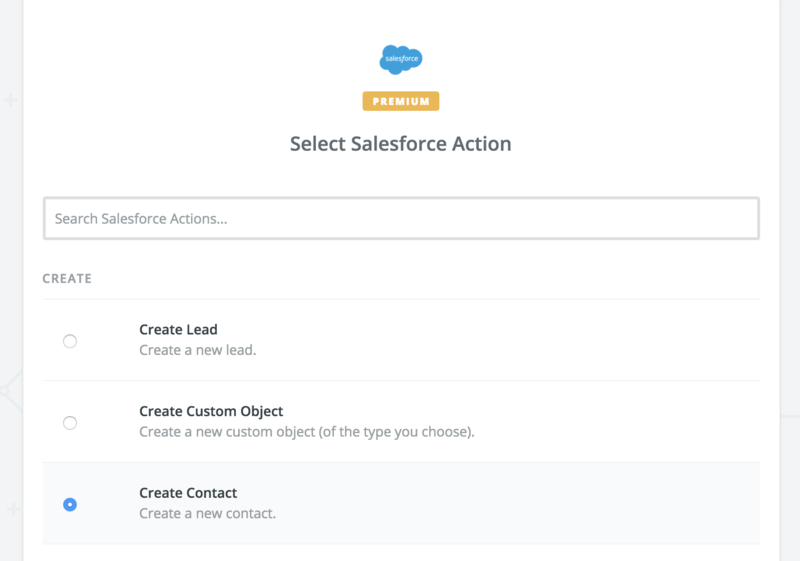 Select "Salesforce" as your Action. Field to Search By: "Account Name"
Select "Create Salesforce Account if it doesn't exist yet?" [Add an Action Step] Select "Create Contact"
[Add an Action Step] Select "Create Event"
That's it! Turn it on and give it a test. Note: Remember that Chili Piper will create a lead on it's own when a meeting is booked. To prevent duplicates, you'll want to create a process builder in Salesforce to either remove the lead or merge it with the new Contact. Please contact support@chilipiper.com or your Chili Piper rep if you require assistance in setting this up.